According to the National Institutes of Health, diabetes affects over 30 million people in the United States – almost 10% of the population. Even more people, 84 million, have what is called pre-diabetes. They have abnormally high blood glucose (sugar) levels but not high enough to be diagnosed with diabetes. Unfortunately, most people in this large group – nine out of 10 – don’t even know they have pre-diabetes, so they can’t make a conscious decision to make lifestyle changes that might reduce their risk of pre-diabetes progressing to diabetes. March 26 is Diabetes Alert Day, held every year on the fourth Tuesday in March. Sepsis Alliance is taking this opportunity to not only share information about diabetes, but how people with diabetes – diagnosed or not – are at higher risk of developing sepsis than people without the disease. With one in four adults in the U.S. living with diabetes, most of us know at least one person who has this chronic disease. Diabetes has no cure. It can be managed, keeping blood sugar levels as close to normal ranges as possible, but it takes work to do so. Consistently high blood sugar levels or wildly fluctuating levels cause damage to your body, from the blood vessels to the organs. Medications and insulin are only part of a treatment plan, however. People with diabetes should also follow a healthy diet and get regular exercise. They also need to watch for signs of injury or illness so they can be treated as quickly as possible to avoid serious complications. Type 1 diabetes occurs when your pancreas can’t provide your body with insulin to break down the sugar you consume. The only treatment for type 1 diabetes is insulin. 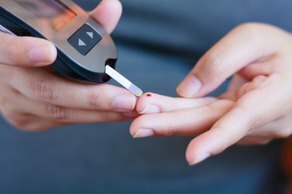 Type 2 diabetes is different from type 1 in that your pancreas can still produce some insulin, but your body stops using it properly. It is often first treated with lifestyle changes and diet, although oral medications to help your body use the insulin more effectively may also be prescribed. If the oral medications alone don’t work, you may be given an injectable medication or insulin. Gestational diabetes occurs only in pregnant women. They may be able to manage their blood sugar levels through careful management of their diet, but some must take insulin for the remainder of their pregnancy after they are diagnosed. Most often, once the baby is born, blood sugar levels return to normal and no more treatment is needed. However, women who have gestational diabetes are at risk of developing type 2 diabetes later in life. So, what does all this have to do with sepsis? One complication of diabetes is your body may have difficulty healing wounds, like cuts and blisters, particularly in the toes, feet, and lower legs. People with diabetes may also have decreased sensation in their feet and toes, which means they may not notice right away if they have an open wound. If wounds take a long time to heal, or they aren’t noticed, they are vulnerable to becoming infected. People with diabetes also have trouble fighting infections. All this puts them at higher risk for developing sepsis. The National Institute of Diabetes and Digestive and Kidney Disease offers a Diabetes Risk Test that you can take to judge your risk of developing diabetes. If you are at risk, speak with your doctor or nurse practitioner about what you can do to help yourself. If you do have diabetes and you haven’t been taught about foot care and other issues related to caring for your skin and preventing infection, speak with your diabetes doctor or healthcare team about the steps you should take. In the meantime, you can visit the Sepsis Alliance Sepsis And… library, where you will find pages such as Sepsis and Diabetes, Sepsis and Bacterial Infections, and more. T – Temperature higher or lower than normal. I – Infection, signs and symptoms of an infection or you recently had a procedure or injury that could cause an infection. M – Mental decline – you’re drowsy, difficult to rouse, confused. Next Next post: Brandi R.